With over 30 years in the industry, we’ve seen lighted floor trims progress from very the very basic standard bulb to today’s LED lighting strips. The standard bulbs used in the early days of lighted floor trims wore out quickly and weren’t very durable, but they were the only option available for lighted theater aisles and hallways. Since then, many improvements have been made to the bulbs to extend their lifespans and improve functionality. The biggest breakthrough? The invention of the LED (Light Emitting Diode). Most LEDs have an estimated lifetime of up to 50,000 hours, compared with 1,000 to 1,200 hours for bulbs. Another benefit is that the LEDs will not get as hot to the touch as a bulb, because there isn’t a “hot” filament in the LED. Typically, the LED, even at its hottest point, will be about 20% of the temperature of a bulb after the same amount of time. The power consumption of an LED is much lower than that of a traditional bulb. The estimated power consumption of our LED aisle and floor trim lighting is only 0.9 watts per every 3 ½ feet. When you’re using LED illuminated stair nosings, you may need a cable management system to hide the wiring going from the power source to the step. In some situations, such as in a theater, you would want to have a lighted cable management system. This would serve two purposes at once – keeping the wiring out of sight and illuminating the darkened walkway. 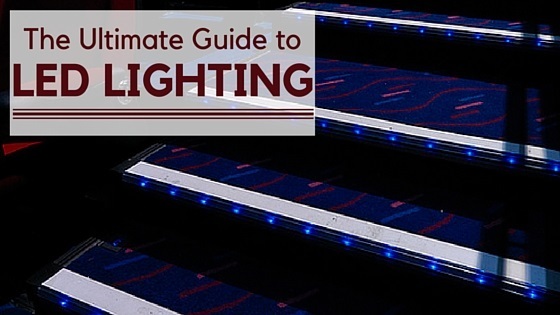 With the Gradus lighted stair nosing profiles, we supply the LEDs in a strip format, which can be joined to together to cover the width of the step. With aisle lighting and floor trim profiles, we offer a lighting loom (coil), which is much easier for a longer application. You wouldn’t need to joint together strips every couple of feet; instead, you can run the loom up to 164 feet without making a joining connection. The lighting loom can be easily cut to the required length. There are a wide range of actual floor trims that hold the LED loom or LED strips for lighting. You can get profiles that transition between two flooring surfaces (carpet to carpet, vinyl to carpet, etc. ), or you can get profiles that can be used at the edge of the floor where it meets the wall. The profiles that are used next to the wall typically have an extension that goes up the wall slightly to provide a smooth transition from floor to wall. LEDs can also be used for wall lighting. Most of the systems that are made for wall lighting will provide a soft illumination to allow for visual access to navigate the walls during showings or performances without being a distraction. LED lighting for theaters and auditoriums is also common. These applications typically involve seat lighting, seat row indicators, and step row indicators, which can incorporate either alphabetical or numerical formats. Step row indicators can also provide directional signage or can be used to denote particular areas, such as wheelchair access points. Which LED is Best for Your Project? LEDs are available in a variety of colors, which can compliment any design scheme. If you have a project that can benefit from a lighted floor trim, aisle lighting, step row indicator, or seat lighting, take a look at what we have to offer. How Much Do LED Lighting Strips Cost?